2 sizes available - 12" x 18" or 18" x 18"
A pair of Aries universal mud flaps might be just the thing to keep your Jeep or truck mud free! These mud flaps feature a large, trimmable rubber flap to match many different wheel & tire combos. The steel hanger can also be trimmed to give you a nice custom fit. 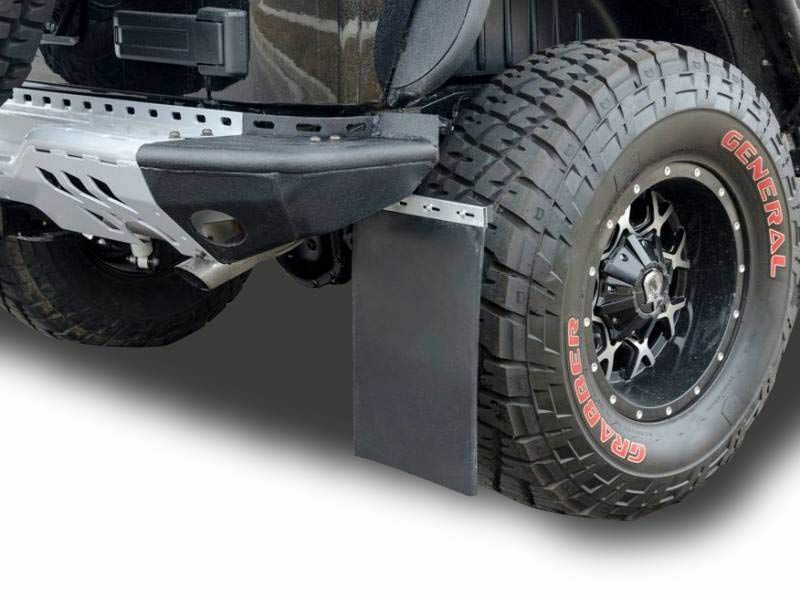 Aries mud flaps also have a quick release system to allow you to remove the mud flaps anytime you might be worried about clearance, such as when you go mud bogging or rock climbing. All of the steel mud flap components have been powder coated to protect against rust. Since these are universal mud flaps, you may have to do some drilling and cutting to get them installed properly. Adding a set of these Aries universal mud flaps will enhance the look of your ride and protect it from rocks, mud or other damaging debris. order yours today! Aries offers a limited lifetime warranty against defects in materials or workmanship on their universal mud flaps. Please contact us if you need to start a warranty claim. Installing a pair of these universal mud flaps is fairly easy with some minor drilling & cutting required to give you the best custom fit and look. If you have any questions or would like any additional information, please feel free to contact us at your convenience.